LUCY BURDETTE: Some people just look and act as though they should be mystery writers--or that's what I thought when I first met Michal Nethercott in a small mystery bookstore in Brattleboro, Vermont. (SEE BELOW--doesn't he have the coolest author photo ever?) Turns out he doesn't only look the part, he writes it too. And we're delighted to host him today on the occasion of his second mystery, THE HAUNTED BALLAD. MICHAEL NETHERCOTT: In my teenaged years I read a lot of Agatha Christie. A lot. Ever since my first encounter with Ten Little Indians, it was the whodunit aspect of her books that always kept me coming back. I won’t say that I never guessed the culprit, but, more often than not, I picked the wrong horse… and was happy to do so. Now, firmly into my post-teen years—very firmly—I myself have become a writer of mystery stories and novels. As such, I readily acknowledge Dame Agatha as a literary godmother of sorts. I take the whodunit-ness pretty seriously and like to offer the reader a heap of suspects with shadowy backgrounds and secret motives. In my latest 1950s era novel The Haunting Ballad I’ve attempted to do just that. The death of a Greenwich Village “songcatcher” (folk song collector) leads my detectives Plunkett and O’Nelligan into a very deep suspect pool. 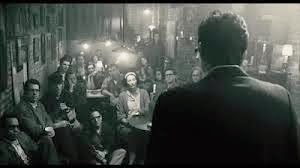 The possible perpetrators include a sultry Beat poet, a blues-belting ex-con, a family of Irish balladeers (who may be IRA), a hundred-and-five-year-old Civil War drummer boy, and a prickly “ghost chanter” who sings ballads that she receives from the dead. And just to stir things up a bit, one suspect is a handsome, persuasive young folk singer who Plunkett's fiancée Audrey is enthralled by. So, why do I—and a legion of other mystery readers—care so much about the who of the dunit? Well, perhaps there’s something about finding one’s self in the midst of a group of people who may or may not be what they seem. Or perhaps there’s something about knowing that, beneath a seemingly benign exterior, one (or more) of this crowd is concealing a figurative dagger (or maybe an actual one.) For me, there’s always been the additional interest in who didn’t do it. That is, I’ve always been sort of comforted at a mystery novel’s end to discover that Mrs. Pumbleshum or Colonel Winterwink was, after all, not a homicidal slayer. Even if one of their friends/family/colleagues was. Besides the characters, of course, plot and setting have their place in the realms of suspense. A zesty, zigzagging plotline, replete with puzzling leads, desperate situations, and plentiful twists and turns, always makes for a good tale. Christie certainly delivered in this, even if, on occasion, her plot arcs left plausibility in the dust. As for setting, while not always central to a mystery’s storyline, it can certainly spice things up. Tony Hillerman’s Navajo West, Dashiell Hammett’s San Francisco, and Sara Paretsky’s Chicago are all fine examples of this. For The Haunting Ballad, I chose Manhattan’s Greenwich Village. In the 50s, the twin whirlwinds of the folk music revival and the Beat scene were converging and the Village was at the heart of it all. It was a swirling, quirky, dynamic world. Michael Nethercott will be part of or conversation today, and one lucky commenter will win a copy of his new book, "The Haunting Ballad." Michael Nethercott is the author of the O’Nelligan/Plunkett mystery series. 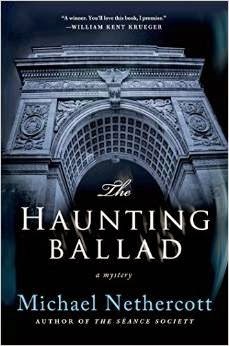 His debut novel The Séance Society (Minotaur/Thomas Dunne) is followed by the newly released The Haunting Ballad. Nethercott has won The Black Orchid Novella Award (for traditional mysteries), the Vermont Playwrights Award, the Nor’easter Play Writing Contest, the Vermont Writers’ Award, and the Clauder Competition (Best Vermont Play.) He has also been a Shamus Award finalist. His tales of mystery and the supernatural have appeared in numerous periodicals and anthologies including Alfred Hitchcock Mystery Magazine, Best Crime and Mystery Stories of the Year, Thin Ice: Crime Stories by New England Writers, and the Crimestalkers Casebook. So nice to meet up with another Agatha Christie reader! I enjoy trying to guess the culprit before the end of the book but I also love plots that have lots of twists and turns that keep me guessing . . . it definitely keeps the pages turning. When I was in high school I found a huge book of Sherlock Holmes mysteries when visiting my grandparents. I read all the stories and didn't do much else while I was there. I think that made them happy. I was a troublesome kid. They swore I was a joy, but you know. The relief was way too obvious to miss when I sat down to read. When I went back home I walked over to the stationery store to see if I could find some more mysteries to read and discovered Agatha Christie. I think that was the first book I ever bought. I used my lunch money to get it and figured I'd read it in the school cafeteria. Of course I finished reading it that night so had to watch everyone else eat the next day. It was worth it. Mostly I like to watch the story unfold . I don't try to figure anything out. Of course ideas come to me, but I just like to get in the middle of it all and live it out with the characters. I think that's the most fun. Mystery immersion. Michael, your double why influence worked on me: I'm a why reader. Why did this crime happen to this person, in this manner, in this place? Why did the antagonist do it? Why did it happen now? Why did the protagonist go into the basement when she knows nothing good ever happens in the basement? BTW, I love your green sweater against the green backdrop. Castle ruins are nice, too. I know Ramona, isn't that the best author photo ever?? Welcome, Michael! "Mystery immersion" -- love it Reine. Yes, that's what I love. Great to hear people's own connections with the whodunit in general and with Agatha Christie in particular. Seeing a film version of Ten Little Indians as a child launched me into reading her novels -- and I've never looked back. 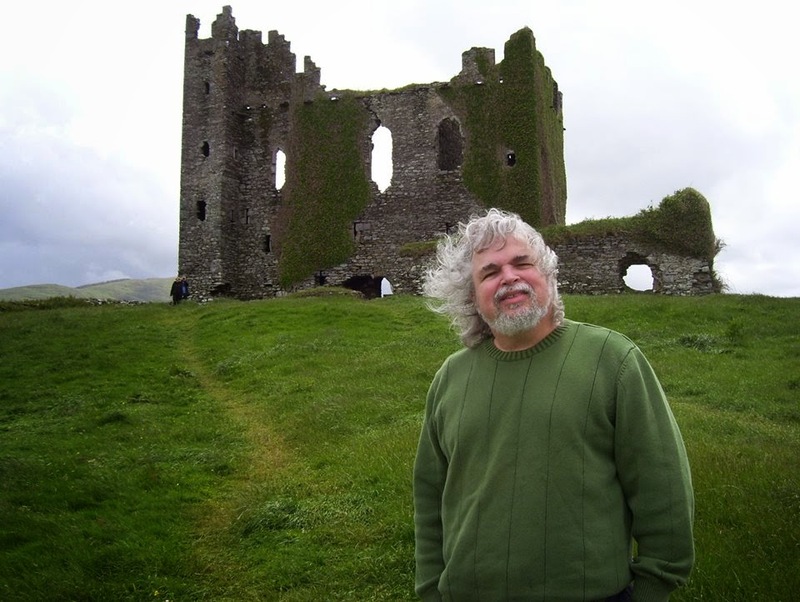 That photo, by the way, is from this summer when my son and I journeyed to Ireland. We were the first father/son team from my family in over 50 years to make a trip back to the old country. I'm standing there in front of some ruins in the town of Cahirciveen where my maternal grandmother was born. Your books sound like my kind of story--can't wait to find them! I like layers of meaning and mystery in the books I read--as another early fan of Agatha Christie. I gather up clues and red herrings and sit back and absorb the story as I go, thinking about the people, the places, the events. Sometimes I have a clear idea of whodunit and why before the book ends--but sometimes, not. And I too have roots in Ireland--where the tale begins in 1761 with a young woman who takes ship for Virginia. Now there's a story to riddle out--why? What caused her to leap into the unknown? How did she manage it? Where did she go when she arrived? What did she leave behind? I don't know that I actively try to figure out "why" either. I mean, I'm interested - but I'm not terribly disappointed if I can't figure it out. Like Reine, I like sitting back and going along for the ride. But like Ramona, I do like knowing the why. Interesting question. Hi, Michael - Congratulations on The Haunting Ballad! Christy, Hillerman, Hammett, Paretsky - they cast a warm shadow on us all! I'm with Reine as far as reading goes! I was a Nancy Drew, Hardy Boys, etc. reader when I was very young! When I outgrew the Hardy Boys I started reading my father's books: Christie and Rex Stout and finally the Gideon series by JJ Marric (John Creasey) and then got into the thriller genre all on my own with John LeCare and then I really branched out. So I can be seduced by the mystery or the character or the location or wonderful writing. What I cannot stand, however, is any mystery that does not play fair when that is the premise. I don't really care if I solve the mystery -- perhaps I even like those I can't solve better, but if the resolution comes from hidden information, I am not a happy reader. SO great to see you--I am SUCH a fan! ANd I always think the why of the who is so important. 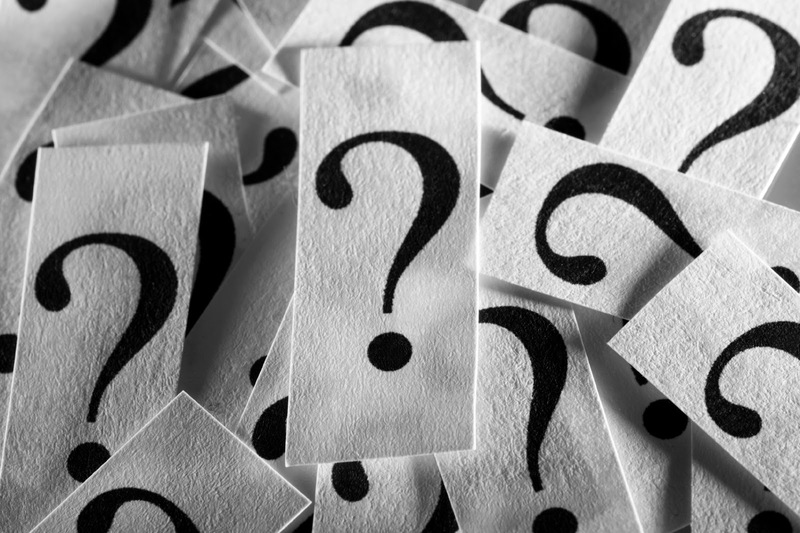 I ask myself every moment of writing--what;s the motivation, and is it believable? And I always try to figure it out. On, TV, too. Pregnant! I'll yell. or: DEAD! And Jonathan will say--can't you just watch? Nope. Hank: Pregnant or dead? Gosh, are those the only options? Jim: Yes, playing fair with the reader is a must. When s/he goes fishing for clues, they should be visible below the surface. Of course, if the occasional red hearing gets yanked up...well, that's just fine. I enjoy it when I sometimes have the "Aha!" moment and the clues have helped me figure it out. But I don't try to solve as I am reading. I enjoy the twists and turns, because they often make me slow down and get into the story more. And I do like to understand the why. I didn't even know there were other types of mystery besides the whodunit for a long time. When I was in second grade, and my classmates were being taught to read, I must have been a pain since I already could read well. My brilliant teacher sent me to the school library for reading class, where I could read to my heart's content: Bobbsey Twins and Nancy Drew and Hardy Boys. Agatha Christie came later. PS Waving hello to Michael, and opting out of the book giveaway, since I won his first, excellent book. What a wonderful author photo!!! And I am thrilled to learn about your work, which sounds like my cup of tea. I can't wait to start reading and The Haunting Ballad is definitely going on my list. So nice to find you here, Michael - welcome! I'll about the who, which does include some why, obviously. Why did who done it done it. But I love the puzzle and trying to figure out the clues before the detective. I usually guess wrong, but that's okay. I once stage managed Ten Little Indians. One of my jobs was to remove each Indian statue when someone was to be offed. They're just supposed to disappear, ya know? I remember to this day with chagrin one performance where apparently EVERYONE saw one going and the murmurs in the audience were audible even backstage. Grrrr. And, yes, the actor who was the killer was on stage at the time so whodunnit? There was no other time I could do it so we changed the staging to pull eye direction elsewhere. Ugh. I enjoy reading the book and getting involved within the pages. The characters and their complex lives are always fascinating. Definitely the "Who" is what most draws me in. I'm always in the hunt for the culprit. I'm most happy when the author fools me, but am pleased with myself if I nail the right suspect. The atmosphere also plays a big part for me, the mistier and moodier the better. I've loved mysteries since my Nancy Drew days. I don't really try to figure out whodunit. I like to let the story wash over me and just see what happens. When I watch Midsommer Murders with my husband I do speculate on whodunit and who's getting it next. That is more self defense though since he's giving a running commentary. Red shirt! I agree with Lucy, Michael, that you have one cool author picture. Like others here, I am delighted with your Agatha Christie connection. Dear Dame Agatha was my first adult mystery series to which I became addicted. The addiction has since spread, and there is zero chance for rehabilitation or cure. And, now, of course, you are adding fuel to my addiction fire with your books, which sound so my cuppa. Choosing what element is most important to me in mystery reading is not something that I can do. Like you, Michael, I am reading, reading, reading to get to the identity of the murderous monster hidden within one of the seemingly innocuous characters. Also, I am a sucker for atmosphere, where the mystery is set and its surrounding mood. "It was a dark and stormy night" thrills me down to my toes. But, I always need to know why the victim had to die, what drove the murderer to do the dastardly deed. So, it might just be the why that becomes most important to me. I want to know what the compelled the murderer to the desperation of murder, what he was thinking before, during, and after. The title The Haunted Ballad just oozes great mood, and the cover is darkly inviting. I love the time setting of the 50s. In those cute little FB quizzes, I usually pick the 50s as a time I'd like to visit. Greenwich Village has to have been fascinating in the 50s. And, I have another book to add to my Halloween reading list that I am posting on my blog and my FB page. So, thanks for the timely visit, Michael, and I look forward to reading your books. I love the cover, Michael. It's eye-catching. I just read an Agatha Christie a few weeks ago as a matter of fact--the first in, uh, hmm, MANY decades. It was interesting to read--it seemed quaint somehow. Not because of the era in which she wrote, but because it was only a whodunnit. I hadn't realized how my tastes had changed. I guess I prefer more full-bodied whodunnits that are also howdunnits or whydunnits, and in which the protagonists have personal subplots going on as well. That seems to be the modern way -- though, do you think we're seeing a return to the classic whodunnits of old? But, I'll my name to the list of readers who was profoundly influenced by Christie as a teenager -- 10 Little Indians, Murder on the Orient Express. I thought she was amazing for thinking up such surprising mystery solutions. If there's not a believeable why to the reason behind the who, the mystery fails for me. The psychology of what goes on in the mind of others if infinitely fascinating. I do love a good setting as well, but character is much more of a draw for me. But in an earlier era, this wasn't the case. As readers, we received relatively little back-story on Poirot or Miss Marple or Nero Wolfe. Basically, a mystery novel dealt with only the particulars and participants of the murder itself. And that was okay in my mind. Not better or worse than modern whodunits; just different. I'm editing a manuscript right now, and one of the comments I received was "These characters seem to only exist for the plot." Michael I think that ties back to what you said: this is a trademark of older novels (Poirot, Marple, Wolfe). We didn't know their backstories. It seems like modern readers want this information.